Fly from the Detroit of India, Chennai, to Thai beauty, Bangkok. We have got the best and cheap Chennai to Bangkok flights for you! To make your travel experience a hassle-free one, browse through our wide range of International flight bookings and get the best of affordable rates only with us. With information like which airline operates at what time to how many flights depart in a day to your travel destination. We provide you with all the information required to book Chennai to Bangkok flights. To book cheap Chennai to Bangkok flights it is recommended to book it 40 – 60 days prior to get your hand on amazing deals. If you are planning to travel from Chennai to Bangkok, then you should visit www.akbartravels.com which is India’s leading travel website. It will help you in comparing, finding and booking cheap flight tickets from Chennai to Bangkok. 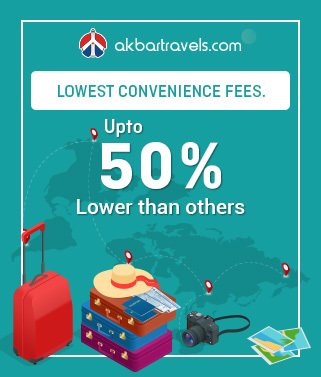 Whether you are booking a one-way flight ticket from Chennai to Bangkok or a return, you can rest assured on getting the best deals and offers on Chennai to Bangkok flight tickets only with Akbar Travels. Booking your Chennai to Bangkok flight ticket online gives you several benefits like insurance, reward points, 24/7 customer support and access to multiple airlines. www.akbartravels.com offers you the widest choice of airlines for Chennai to Bangkok flights so you can choose you’re most preferred date, time, date, and a number of stops for your flight. Being the capital city of Thailand, Bangkok is known for its active nightlife, wonderful architecture, rich culture, and its lively street life. Once the seat of the Ayutthaya and Chakri dynasties, today Bangkok features among the topmost urban spaces in the world. Be it the famous old temples, bustling flea markets, happening nightclubs and charming historical monuments, Bangkok has something for every visitor. Buddhist temples like Wat Pho, Wat Phra Kaew and Wat Arun are most famous sights in Bangkok. One can find the influence of Hinduism in Thai culture in Erawan Shrine and Giant Swing. For exploring the beautiful architecture, one can visit the Jim Thompson House and Vimanmek Mansion in Dusit Palace. Visitors who are interested in art, history and culture can explore the Bangkok National Museum and The Royal Barge National Museum. Apart from this, the other famous places to visit are The Grand Palace, Golden Buddha, Lumphini Park, Safari World, Patpong, Pratunam Market, Soi Cowboy, Rattanakosin Island and many more. Bangkok Suvarnabhumi Airport (BKK) - 222 Moo, 10 Vibhavadi Rangsit Road, Srikan Don Muang, Bangkok 10210, THAILAND. Being an ideal holiday spot, Bangkok is a year-round destination. Every season has a distinct charm and the city is at its captivating best all months of the year. However, the peak season is between the months of November and March when the tourist footfall is particularly high. The months of March, April and May are the hottest in Bangkok. Bangkok is well-connected by air to the rest of the world as there are two major airports in the city. The Suvarnabhumi Airport is located to the east of Bangkok and the Don Mueang Airport to the north. Most domestic and international airlines operate at the Suvarnabhumi Airport, which is linked to the city by taxis, buses taxis and Airport Rail Link. Bangkok is well-connected to the rest of Thailand and to neighboring countries like Malaysia, Laos and Cambodia by train. The chief railway station is the Hua Lamphong Railway Station where trains from neighboring countries and other parts of Thailand function. The Thornburi Train Station serves for local or nearby travel. Buses to and from other parts of Thailand including Ko Samui, Pattaya, Krabi and Phuket and also to neighboring countries operate in Bangkok. There are three major bus terminals in Bangkok i.e. the Northern Bus Terminal, the Eastern Bus Terminal and the Southern Bus Terminal. Visitors can book their bus tickets directly at one of these three public bus terminals and avoid travel agents and private buses, which are not the most reliable. While Bangkok isn’t necessarily known for its array of outdoor activities, visitors may be surprised at what they can find and do here. In and around the city, hidden gems of adventurous activities, pleasant outdoor escapes and wildlife close encounters abound. So if you’re an adventure lover wondering what to do in Bangkok, here are a few things you should try! 1. Which months have the lowest fare for the Chennai to Bangkok flights? -The cheapest month for the flights from Chennai to Bangkok is August. 2. Which is the best month to travel to Bangkok ? -April is the best month to visit Bangkok as the Thai New Year is celebrated with traditional customs in this month. -Suvarnabhumi Airport is located at a distance of 30 km from the city centre. -Suvarnabhumi Airport is connected to the city center through metro, express buses, and taxis. -The currency used in Bangkok is Thai Baht. 1 Thai Baht is approximately valued at Rs.2.25 INR. You can check the currency conversion centres for more details. -There is a time difference of 1 hour and 30 minutes between India and Thailand. 1.What are the top airlines that operate from Chennai to Bangkok flight route? 2.How many weekly flights are there from Chennai to Bangkok? -There are approximately 19 flights in a week from Chennai to Bangkok. 3.At what time does the first flight leave from Chennai to Bangkok? -The first Chennai to Bangkok flight is Thai Airways at 12:55 AM. 4.When does the last flight leave from Chennai to Bangkok flights? -The last Chennai to Bangkok flight is Thai Airasia at 10:25 AM. 5.What are the airport codes of Chennai and Bangkok? -Airport code of Chennai is MAA and Bangkok is BKK. -The name of the airport in Bangkok is Suvarnabhumi Airport. -The name of the airport in Chennai is Chennai International Airport. Longest Reigning Monarch: King Bhumibol the Great also known as Bhumibol Adulyadej was the longest the world;s longest-serving head of state, reigning since 9 June 1946 he was, until his time of his death. Weekend Market: Bangkok’s world famous, record holding weekend market, Chatuchak Weekend Market is spread out over 27 acres. Origin of the Red Bull drink: The original Red Bull energy drink, , was invented by Chaleo Yoovidhya in 1976. He created the first caffeine/sugar jet lag remedy.